Print Monkey » Three guys…. Such a great book, whether you work in the creative industry or not. Written by Jim Shields, who owns and runs Twist & Shout Communications, based in Leicester. 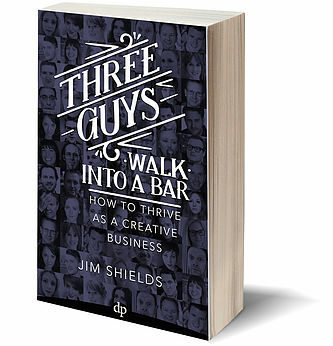 A self-confessed disciple of new-marketing Guru Seth Godin, Jim tries to spread the word at every opportunity that we, the people, have the means of production at our fingertips. We no longer need a mill owner to employ us – we can make things on our own out of zeros and ones. Jim believes in giving yourself permission to start. Be specific. Chase quality.